A swimming pool is a fantastic idea for a hot summer, but it also represents a very real safety risk as the high number of drownings over the last few years can attest to. It is for this reason that the legislature saw it appropriate to provide regulations that govern the safe operation of swimming pools. Part D4 of the National Building Regulations (“regulations”) requires that an owner of any site which contains a swimming pool must ensure that access to such swimming pool is controlled. The regulations continue and state clearly that any owner who fails to comply with this requirement shall be guilty of an offence. Additionally, a home owner can also be sued for negligence should someone drown in their swimming pool, depending on whether negligence was present. 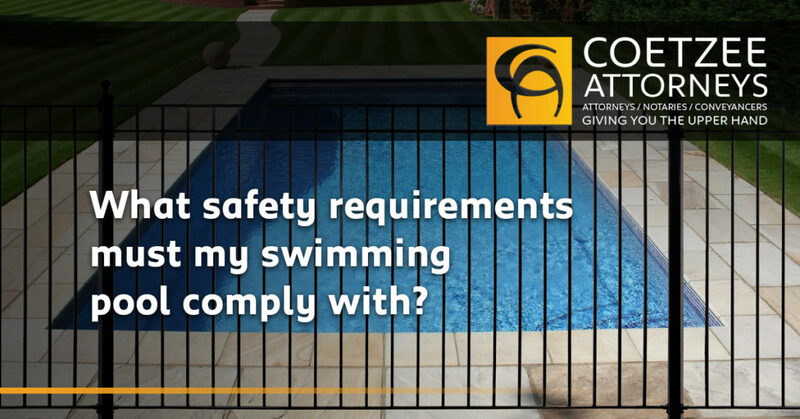 A pool that however does not meet the required safety standards or where those measures are not effective can provide the necessary grounds for showing negligence on the part of the owner. Part D5 of the regulations further state that an owner shall be deemed to have satisfied the necessary control requirements where access to the swimming pool complies with the relevant South African National Standards (“SANS”), as published by the South African Bureau of Standards(SABS). b) A building where such building forms part of such wall or fence. 2. A wall or fence shall be provided in any interconnected complex which contains a swimming pool or swimming bath to ensure that no person can have access to such pool or bath from any street or public place or anywhere within the complex other than through a self-closing and self-latching gate with provision for locking in such wall or fence. 3. Such wall or fence and any such gate therein shall be not less than 1.2 metres high, measured from the ground level, and shall not contain any opening that will permit the passage of a 100mm diameter ball. 4. The constructional requirements of any steel fence or gate must comply with the requirements in SANS 1390. Extra protection, such as pool covers, pool nets and warning devices can also be used in addition to a fence, with such protective measures having to meet certain SANS compliance standards. Make sure that if you use any of these, you enquire from the supplier whether it is SANS compliant. Owners should be aware that some municipalities may have by-laws that govern and may provide for even stricter safety measures regarding a private swimming pool, and the requirements of these bylaws will have to be adhered to. Make sure you find out regarding any local bylaws that may require additional safety measures for your pool. And lastly, it is important that any pool owner ensure that the safety measures in place are adhered to i.e. that the gate latch works and that the pool cover is secured, etc. Negligence can still exist where reasonable efforts are not taken to ensure that the safety measures are effective and you as the owner are responsible for making sure that no unfortunate incident happens at your pool.